Oban Backpackers - Chill out on your travels at one of Scotland's most laid back hostels in the heart of beautiful Oban! Chill out on your travels at one of Scotland's most laid back hostels in the heart of beautiful Oban! Oban Backpackers is situated in the heart of Oban just a 10 minute walk from the bus, ferry and railway stations. Our central hostel is perfectly located to enable you to experience all that Oban has to offer without burning a hole in your wallet! 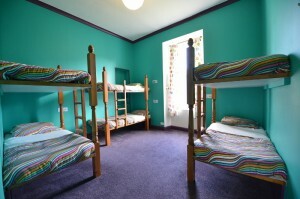 We offer dormitory style accommodation within our 7 hostel bedrooms. Our smallest room sleeps 6 people and our largest sleeps 12. We have wide, comfortable, spacious bunk beds, and they come made up with fitted sheets, duvets and 2 comfy pillows so there is no need to bring your sleeping bag. Our showers are powerful with loads of hot water and if required, you can hire a towel from reception. Our fully equipped self- catering kitchen has everything you will need to cook up your favourite meals and there is plenty of storage and fridge space available for you to use. It’s such a relaxing place to stay and unwind, with its big cosy lounge that boasts a real coal fire, pool table, comfy sofas, free tea, coffee & hot chocolate, free WiFi, musical instruments, games, book swap and loads of info on the local area. It’s a great place to meet like-minded people and although you might think you’re only staying one night, you’ll end up staying three or four – it’s that kind of place! In the evenings, if you want to enjoy Oban’s night-life our staff can point you in the right direction. The Oban Backpackers staff are a friendly bunch who know the surrounding area like the backs of their hands and are willing to help so don’t be shy! Come and have a chat at reception and we can make sure you make the most of your time in Oban. Please bring photographic identification. You will need this to check in to our hostel. All of our accommodation is is dormitory style rooms and the minimum age requirement to stay with us is 18 years old. We can accommodate families with children but they must book an entire room for sole occupancy as children cannot stay in dormitory rooms with other guests.